New research shows "primer vaccines" could be key to developing a universal flu vaccine. 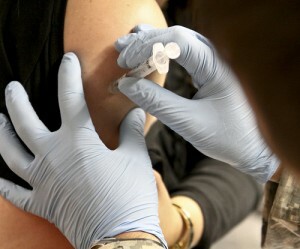 New research has shown that “priming” a person with flu DNA improves his response to a flu vaccine. Scientists from the US National Institute of Allergy and Infectious Diseases (NIAID) reached that conclusion after two clinical studies. The results are important because they show it may be possible to develop a universal flu vaccine. A majority of volunteers who received a DNA vaccine for H5N1 avian influenza 24 weeks before a vaccine booster developed large numbers of special antibodies believed to defend against the “globular head” region of flu proteins. Traditional flu vaccines are designed to create the same response, but since these flu protein heads change frequently they must be redeveloped each year. In some volunteers, however, the “prime-boost” vaccine also produced antibodies that worked against a part of the flu virus called the HA stem, which remains the same across many flu strains. That’s a lot of science speak, but basically it means this type of vaccine may be a way to combat the challenge of constantly mutating flu viruses. The results of these studies demonstrate an important proof of concept, in that it is possible to elicit broadly neutralizing influenza antibodies in humans through vaccination […] These findings mark an early but significant milestone on the pathway to a universal influenza vaccine that provides protection against multiple virus strains. Next, the team will try to improve its DNA and other gene-based vaccines to more readily elicit antibodies directed at the stem region of the HA protein. Hay fever season: Will you suffer abroad? Expat Health provides health industry professionals and expat employers with an in-depth look into the developments of world health. Keep up with the latest developments with our monthly newsletter by signing up below. Global Health Map of infectious diseases and health alerts.